Folliculitis is a common skin problem characterized by inflamed hair follicles. Your hair follicles are the small cavities around the roots of your hair. At first, you may notice whiteheads or small red bumps around your hair follicles. Once the infection spreads, it can turn into crusty sores that are slow to heal. Folliculitis home remedies are very important to help treat the irritating bacterial skin infection. Folliculitis is actually a type of acne breakout, or skin abscess. You can have the condition anywhere on the body where there is hair, but it is most common on the face, scalp, armpits, back, chest, neck, thighs, and buttocks. The infection could affect just one hair follicle or multiple follicles. How Long Does Folliculitis Take to Heal? In acute cases, folliculitis is thought to be minor, and treatment may not be necessary. However, medical treatment will be necessary when there is skin irritation, as well as a fever, pus-filled and smelly bumps, or a spreading rash. When folliculitis is slow to heal, your doctor may recommend prescription medications or over-the-counter drugs like NSAIDs (non-steroidal anti-inflammatory drugs) or antihistamines to relieve itching or pain. Bacterial folliculitis treatment in particular will include a variation of oral or topical antibiotics and antibacterial skin washes with benzoyl peroxide, “Phisoderm,” or chlorhexidine. Antifungal medications, shampoos, or creams may also treat yeast or fungal folliculitis. Chronic cases of folliculitis can also be difficult to treat and may require antibiotics and other drugs. If all conventional treatment fails, your doctor may suggest laser hair removal. You should not remove hair by waxing, plucking, or shaving before your treatment. This is because allowing your hair to grow helps to heal your follicles. In the case of chronic folliculitis, your doctor may suggest hair growth for up to three months. Any drug is not without its side effects. Antibiotics put you at risk of antibiotic resistance, heart disease, cancer, allergies, and all sorts of digestive problems. NSAIDS are linked to health risks such as hearing loss, DNA damage, anemia, hypertension, fertility problems, and even certain cancers. Coconut oil is more than just a healthy fat for cooking. Coconut oil contains several important compounds that are useful for the skin, including the fatty acids capric acid and lauric acid. Both lauric acid and capric acid are later converted to monocaprin and monolaurin that help protect the skin. The antibacterial effects of capric acid and lauric acid were displayed in a 2014 study published in the Journal of Dermatological Science. Use virgin coconut oil and apply it to your infected area daily. Neem leaves or neem oil is credited with antiseptic and antifungal properties. Neem oil is made from the seeds and fruit of an evergreen tree called Azadirachta indica. In traditional Ayurvedic medicine, neem is used to treat a variety of skin conditions, including folliculitis. What is an effective natural folliculitis treatment with neem? You can either use neem oil or boil some neem leaves. Both natural home remedies can be rubbed onto the area infected with folliculitis. It is a good idea to apply neem treatment two to three times daily for the fastest results. Aloe vera is another natural folliculitis treatment home remedy due to its potent antibacterial and anti-inflammatory properties that help relieve the burning and itching associated with folliculitis. It also allows your skin to heal naturally. Aloe vera gel or juice from the inner fillet is the option to treat skin conditions, and it should be applied to your infected skin for about 15 minutes. 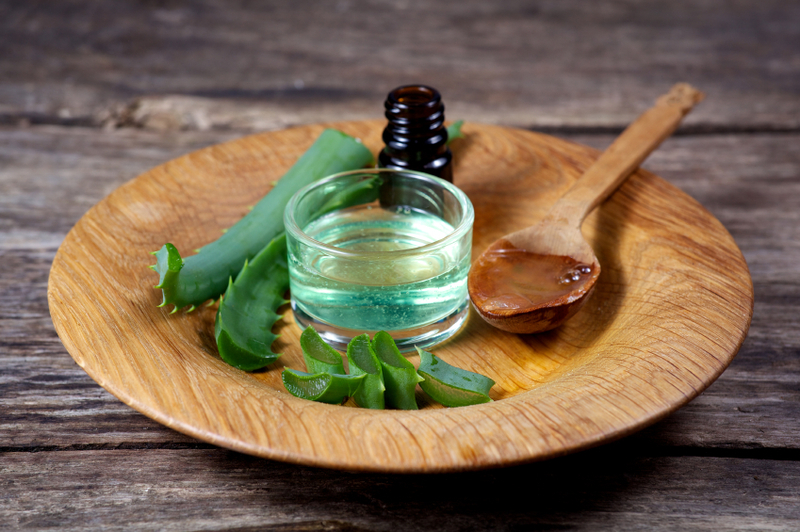 Aloe vera can also effectively treat skin conditions when combined with coconut oil and jojoba oil. Garlic (Allium sativum) is considered one of the better antibacterial natural home remedies. Garlic contains sulfur compounds called allicin that have potent antiviral and antibacterial properties that help treat various skin conditions, including folliculitis. Garlic also contains vitamin C and other anti-inflammatory compounds that inhibit the enzymes cyclooxygenase and lipoxygenase, which contribute to inflammation. To help treat folliculitis, eat three or four garlic cloves daily, or use garlic supplementation capsules for a higher potency. Turmeric (Curcuma longa) is one of the most famous natural home remedies used in Ayurvedic medicine and traditional Chinese medicine. It contains the potent anti-inflammatory compound called curcumin that has been demonstrated to treat skin disorders like folliculitis. To use turmeric for folliculitis, simply dissolve one teaspoon of turmeric in a glass of water and consume twice daily for fast results. Vinegar is used to decrease the occurrence of rashes due to folliculitis. Both apple cider vinegar and white vinegar are often used to help relieve folliculitis. Apple cider vinegar in particular contains antibacterial, antiseptic, and antiviral properties. To treat the condition, combine one part either white vinegar or apple cider vinegar and two parts water (the water should be at room temperature). Use a clean cloth and apply it to your irritated skin for five to 10 minutes. Witch hazel is also a natural folliculitis treatment. Native Americans have long recognized witch hazel as a treatment for skin irritations. Witch hazel contains astringent properties like tannins, which help alleviate the pain and itching associated with folliculitis. Witch hazel also helps treat other skin conditions like chest acne and varicose veins. Dab a cotton ball with witch hazel on the areas of your skin that are infected with folliculitis. It is a good idea to choose an unscented and alcohol-free witch hazel. Oil of oregano (Origanum vulgare) is also among the natural home remedies for folliculitis, and other skin problems. Oil of oregano contains potent antibacterial properties such as carvacrol and terpenes. It also has thymol, which works as a natural fungicide with antiseptic properties. Oil of oregano is best used on the skin when combined with carrier oils like sweet almond, jojoba, or grapeseed oil. It is important to note that oil of oregano should be avoided on sensitive or broken skin since it can cause irritation. Another effective and natural folliculitis treatment includes essential oils. The antibacterial and antiseptic properties in some essential oils help rashes clear up faster when used on a regular basis. Mix a few drops on essential oils in an equal amount of water. When you apply the essential oil combination three to four times daily, you will likely see folliculitis disappear in less than a week. Natural essential oils include thyme, lavender, tea tree oil, lemon, geranium, peppermint, eucalyptus, rosemary, cinnamon, and bergamot. Homeopathic remedies are also considered effective for folliculitis. Certain homeopathic remedies that you should include in your home kit for folliculitis include pyrogenium, graphites, thuja, Sulphur iodatum, hydrastis, Arsenicum album, sulphuricum acidum, anthracinum, erysipelas, Hepar sulphuris, lachesis, Carbo vegetabilis, Secale cornutum, and Tarantula cubensis. It is a good idea to consult with a homeopath who will help select the most appropriate remedy for you. Increasing your water intake: You should aim to drink eight to 10 glasses of filtered water daily. Drinking water helps to stimulate the immune system and prevent further infection. Traditional Chinese medicine: In traditional Chinese medicine, astragalus root is used in combination with other herbs for spleen insufficiency, especially when diarrhea is also present during folliculitis. Other effective remedies include Echinacea, goldenseal, and cleavers. Hot water compress: A hot water compress will also ease itching and reduce inflammation linked with folliculitis. Change bed sheets: It is also a good idea to change your bed sheets often—daily if you can. Proper hygiene: Cleanse the infected area twice daily with warm water and antibacterial soap. Always use clean hands and a clean towel for drying. Soothing soak: Pain and itching symptoms may also be lessened by soaking in a tub of anti-inflammatory oatmeal or a cup of baking soda. The recovery period or healing time of folliculitis will depend on the type of folliculitis and how early the condition is detected. You may have deep folliculitis or superficial folliculitis. Superficial folliculitis types will include hot tub folliculitis, barber’s itch, and bacterial folliculitis, whereas deep folliculitis includes gram-negative folliculitis, carbuncles, and boils. If folliculitis is detected early, then the problem is likely resolved within a week or two. That being said, deep folliculitis is often a long-term issue where proper treatment is required to enhance recovery time. Often, folliculitis is not a serious health problem; however, it can leave skin blemishes. Also, keep in mind that symptoms of folliculitis can relapse, and permanent hair loss may result. Folliculitis can be contagious, but it all depends. In general, folliculitis is harmless and self-limited, and therefore often not thought of as contagious. However, infectious cases of folliculitis can be transmitted from person to person through skin contact or sharing bathtubs. The disease can also be contracted when you come into contact with contaminated personal items, including soaps, razors, towels, clothing, or other skincare products. You can also pick up fungi or bacteria at unclean spas or pools. The bacteria called Staphylococcus aureus often causes bacterial folliculitis. Inadequate water treatment with chlorine or bromine will also lead to the bacteria Pseudomonas aeruginosa that leads to hot tub folliculitis. What are the most common signs and symptoms of folliculitis? When the signs and symptoms don’t disappear after a few days, it is a good time to see your doctor. Avoid wearing tight or irritating clothing: This method will decrease friction between your clothing and skin. Avoid shaving over bumps on your skin: Limit shaving or trim hair instead. If you have to shave, then change your razor blade every time, or use an electric razor; apply generous amounts of shaving cream before you start; shave in the direction of hair growth; and moisturize well afterwards. Wash with warm water: When you shower or bathe, wash your skin with warm water and natural antibacterial soap. Avoid using oils on your skin: Using oils on your skin should be avoided since oils can trap bacteria in your skin pores, and folliculitis can develop. Use skincare products without harsh chemicals. Use clean towels: If you already have folliculitis, make sure you use a clean towel and washcloth. Also, never scratch your bumps. Utilize clean tubs: Only use clean heated pools and hot tubs. Dry out rubber gloves: If you frequently wear rubber gloves, clean them properly. Turn them inside out after each use, rinse them with water and soap, and dry them well. Eat a healthy diet: Avoid common allergens like nuts, gluten, dairy, and shellfish, as well as fried foods, trans fats, hydrogenated oils, and processed foods. Instead, consume organic vegetables and fruit, clean lean protein, and anti-inflammatory foods like coconut oil, flaxseeds, and chia seeds. Folliculitis is a skin condition in which there is hair follicle inflammation. In acute cases, folliculitis treatment may not be needed. In more severe cases, antibiotics, antihistamines, and NSAIDs may be required. That being said, in this article, we detailed 10 key home remedies that your naturopathic doctor or holistic nutritionist may recommend to help treat folliculitis. These remedies include coconut oil, neem, aloe vera, garlic, turmeric, white vinegar and apple cider vinegar, witch hazel, oil of oregano, homeopathic remedies, and essential oils. You can also prevent folliculitis by practicing proper skincare, avoiding wearing tight or irritating clothing, and following an anti-inflammatory diet with foods like coconut oil, chia seeds, and flaxseeds. Cole, G.C., “Folliculitis,” Medicine Net; https://www.medicinenet.com/folliculitis/article.htm#folliculitis_facts, last accessed Feb. 13, 2018. Fischer, K., “Folliculitis,” Healthline, Jan. 7, 2014; https://www.healthline.com/health/folliculitis, last accessed Feb. 13, 2018. “Are You at Risk for Antibiotic Resistance?” Dr. Axe; https://draxe.com/antibiotic-resistance/, last accessed Feb. 13, 2018. Ji, S., “Ibuprofen Kills Thousands Each Year, So What Is The Alternative?” GreenMedinfo, June 4, 2012; http://www.greenmedinfo.com/blog/ibuprofen-kills-more-pain-so-what-alternatives. “What is Folliculitis?” WebMD; https://www.webmd.com/skin-problems-and-treatments/what-is-folliculitis#2, last accessed Feb. 13, 2018. Leonard, J., “Folliculitis: Causes, symptoms, and treatment,” Medical News Today, July 24, 2017; https://www.medicalnewstoday.com/articles/318551.php, last accessed Feb. 13, 2018..
Kerkar, P., “Is Folliculitis Contagious and How to Get Rid of It?” ePain Assist; https://www.epainassist.com/skin/is-folliculitis-contagious-and-how-to-get-rid-of-it, last accessed Feb. 13, 2018. “Folliculitis,” Mayo Clinic; https://www.mayoclinic.org/diseases-conditions/folliculitis/symptoms-causes/syc-20361634, last accessed Feb. 13, 2018. “How to Get Rid of a Rash: 6 Natural Rash Home Remedies,” Dr. Axe; https://draxe.com/6-rash-natural-remedies/, last accessed Feb. 13, 2018. Sherwood, C., “13 Home Remedies for Folliculitis,” Home Remedy Shop web site, July 21, 2015; http://www.homeremedyshop.com/13-home-remedies-for-folliculitis/. “Folliculitis Prevention,” Mayo Clinic web site; http://www.mayoclinic.org/diseases-conditions/folliculitis/basics/prevention/con-20025909, last accessed January 12, 2016. “Treating folliculitis with homeopathy,” Homeopathy Natural Therapeutic Methods web site; http://www.homeopathyguide.net/pathologies/folliculitis/, last accessed January 12, 2016. Fischer, K., “Folliculitis,” Healthline web site, January 7, 2014; http://www.healthline.com/health/folliculitis#Overview1. “Folliculitis,” MedicineNet.com; http://www.medicinenet.com/folliculitis/page2.htm, last accessed January 12, 2016. “Folliculitis – Topic Overview,” WebMD web site; http://www.webmd.com/skin-problems-and-treatments/tc/folliculitis-topic-overview?page=2, last accessed January 12, 2016. “Folliculitis,” Mayo Clinic web site; http://www.mayoclinic.org/diseases-conditions/folliculitis/basics/symptoms/con-20025909, last accessed January 12, 2016. Huang, W.C., et al., “Anti-bacterial and anti-inflammatory properties of capric acid against Propioniberterium acnes: a comparative study with lauric acid,” Journal of Dermatological Science, 2014; 73(3): 323-240, doi: 10.1016/j.dermsci.2013.10.010. Epub, Nov. 7, 2013.